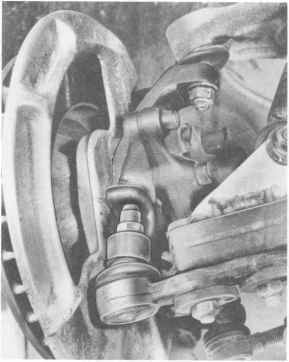 Until end of model year 85, mountings with trail ing ball joints were installed on the front axle. 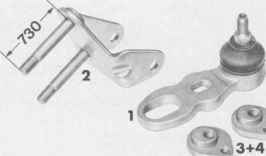 As of September 1983, steel mountings were used instead of aluminum. This change also necessitated a modification of the camber and caster eccentric retaining clamps. 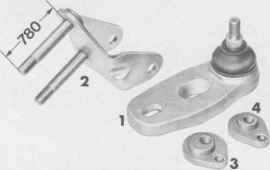 The caster and camber eccentrics installed with the steel mountings are identical parts and are distinguished from the earlier versions by the stamped part No. 928 341 466 00. Steel mountings with upright ball joints were installed from model year 86 o n w a r d (modified wheel suspension). 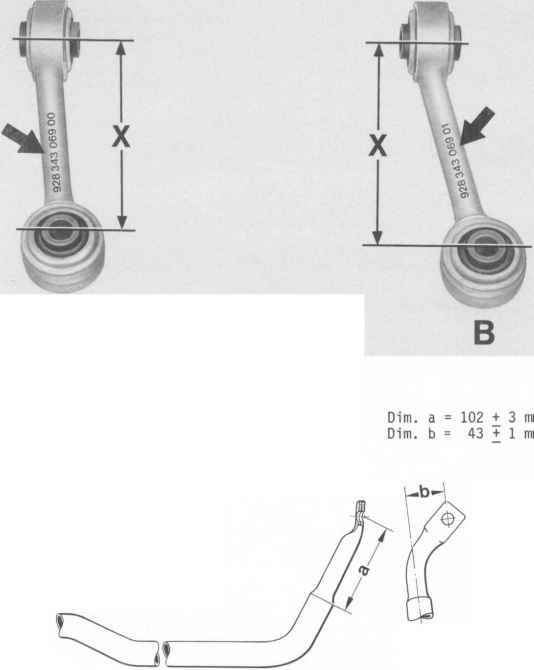 This modification included redesigning retaining clamps and camber and caster eccentrics (retaining clamp with modified mounting point for spring strut, as control arm shorter but same strut position as in cars earlier than model year 86). There is no difference between caster and camber eccentrics, which are distinguished from the original and modified versions by the stamped part No. 928 341 466 01. The position of the eccentrics has been changed to suit the modified mountings. Caster is now set at the inner and camber at the outer eccentric. The original type of mounting has now been discontinued. The modified versions may be retrofitted to these cars. Original and modified parts are not interchangeable. This means that when a modified mounting is installed in an older car for the first time, new clamps and eccentrics must also be used. It is permissible to install a modified mounting on one side only. Under no circumstances may clamps for cars of model year 86 onward be used (danger of confusion, see note on page 40 - 6e). As with the steel mountings in cars earlier than model year 86, the caster is set at the inner and the camber at the outer eccentric. It is essential to ensure that incorrect parts are not installed. There is a danger of mixing up modified and new/current parts. Example: if TEe wrong clamp is mounted, the installation position of the spring strut is incorrect and the clearance between spring strut and upper control arm may be impaired. Clamp: 2 beads at front (arrows) Eccentric: stamped part No. Clamp: No beads at front Eccentric: stamped part No. 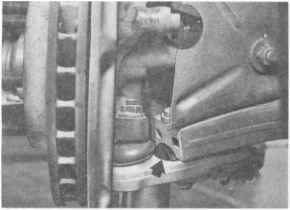 As of September 1982, plastic sealing cord is used to close the slots for the outer setting eccentrics of the front-axle ball joints of new cars. In this way, dirt is prevented from penetrating the joint, making the eccentric easier to operate when servicing. If work has been carried out on the front axle, and especially after realignment of the wheels, close the slots for the outer eccentrics with permanently-elastic sealing material on all cars (arrows). The sealing cord, part No. 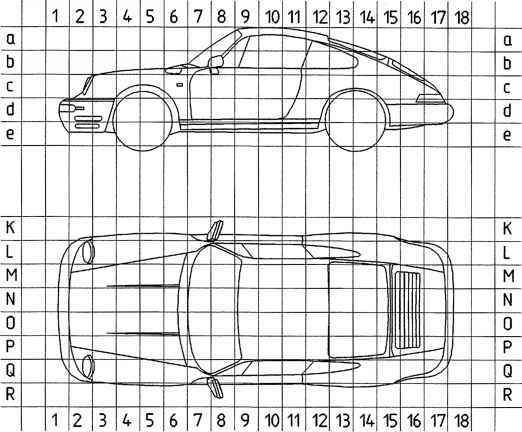 AKD 522.009, used to seal the 924 and 944 tail lamps is suitable for this application. Before sealing, ensure that slots are dry and free of grease. If eccentric does not move freely (dirt in slot) we recommend removal of the outer eccentric, cleaning of the slot and spraying with rust remover. Apply Optimoly TA to sliding surface of eccentric in adjustment area and reinstall eccentric. Never try to free eccentric by hitting ball joint. Impact may damage the rubber cap. If the rubber cap of a ball joint is damaged, it is essential to replace the joint. 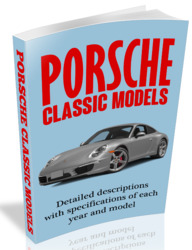 See also "Inspecting Protective Caps of Ball Joints of Control Arms and Track Rods" (page 40 - 24). "Inspect seating and operation of all joints to steering gear, track rods, suspension links and joints, as well as the leaktightness of the protective caps". We recommend that the protective caps of the joints be checked whenever work is carried out on the front axle (visual inspection). 1.Raise car on hoist, steering lock disengaged. 2.Turn front wheels to lock. 3.Inspect visible areas on left and right after cleaning. Concealed cracks are revealed by pinching the rubber cap with the fingers. 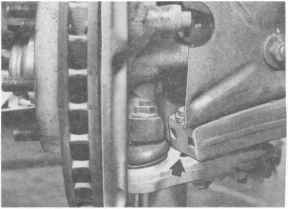 4.Turn front wheels to opposite lock and inspect other half of rubber caps. In the vicinity of the brake cover plates, a small area cannot be inspected visually. Check this area by hand. 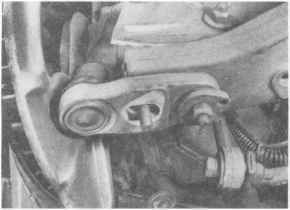 To avoid damaging the rubber boot of the lower ball joint (mounting) with a commercial puller, the steering knuckle has a press-off lug (only steering knuckles for floating brake calipers). Steering knuckles without press-off lug have been discontinued and are no longer available as spare parts. When the securing nut is slackened (cap nut - previously normal self-locking hex nut) the pin of the ball joint is pressed out of the steering knuckle, because the cap nut acts against the press-off lug. Use VW 267 a to press off as before (page 40 - 14).